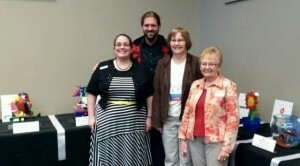 The East Central Regional Library (ECRL) conference session entitled “Creating a Wow! Legacy Project” perfectly met the MLA “Better Together” conference theme. ECRL staff and Library Legacy project sculptor, transported and installed the glass sculptures created through the “Kids Design Glass” project. Barbara Misselt and Vickie Sorn described the project process. 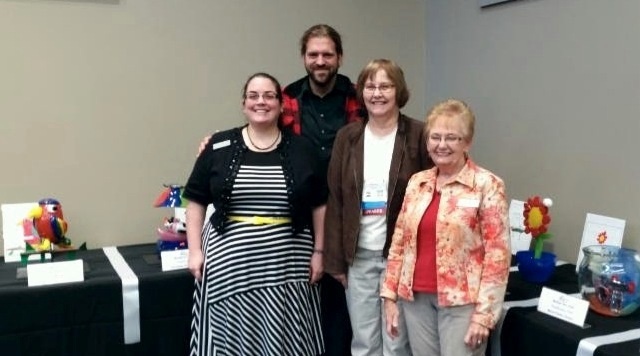 Sculptor Anthony Michaud-Scorza talked about the creation of the art pieces – from children’s artwork to blown glass, assisted by Legacy staff Cortney Walbridge and Patty Thompson. Note the glass sculptures on the display table in the background. “Kids Design Glass” was made possible with money from Minnesota’s Arts and Cultural Heritage Fund and the people of Minnesota for Library Legacy activities. This entry was posted in Legacy, Regional News and tagged ACHF, ECRL, glass, glassblowing, MLA, mnlib14, public art, sculpture. Bookmark the permalink.